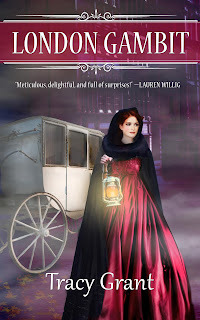 DEBORAH CROMBIE: I've been a huge fan of Tracy Grant's Regency intrigue novels since the very first book, have followed them through the game changes (see below!) and always eagerly anticipate a new adventure. Tracy, like me, fell in love early on with Georgette Heyer's Regency novels, and then with Golden Age mysteries, then went on to create her own unique world. I don't know anyone who combines fascinating and accurate historical detail with romance, mystery, intrigue, and memorable characters as well as Tracy. How could anyone resist this description from the latest Malcolm and Suzanne Rannoch book, London Gambit, which comes out Thursday! Tracy has taken the challenges faced by most series' writers and doubled them--or is it quadrupled? (You will see!) Dealing with the peculiar problems of series characters is a dilemma close to my heart--here's how Tracy does it. TRACY GRANT: I love series, both as a reader and as a writer. As a reader, I love to follow the twists and turns and speculate with other readers of the series. I worry about favorite characters and checking back in with them is like reconnecting with old friends (with Debs' Gemma and Duncan, I feel I know them and their world so well it’s like stepping into their house for a cup of tea or sitting across from them in a pub over a pint). With my own writing, my mind inevitably thinks in terms of a series. After a book, I’m always wondering what happens next for the characters and even when I get ideas for new characters, I want to fit them into the pre-existing world. Recently, I was asked whether I have the series planned out or make it up as I go along. The answer, I realized, was a bit of both. My series is particularly complicated because I started out telling the story of Charles and Mélanie Fraser and then when I changed publishers and couldn’t take the series forwards, I decided to go back in time and tell their back story. But I had to change their names, so they became Malcolm and Suzanne Rannoch. Different names but still spies for opposite sides in the Napoleonic Wars (he for the British, she for the French) who end up married to each other. Eventually I had to move the Malcolm and Suzanne books into a sort of parallel universe for a book or two to catch up the two series and move forwards to the books I had originally planned to write in Fraser universe. Not the way I would have chosen to do it, but it did allow me to dramatize their history at the Congress of Vienna and the Battle of Waterloo and in Paris after Waterloo, which I loved telling. Because I went back in time, I more or less knew how I wanted those early stories to play out. But there were still plenty of details to fill in and some points where what I thought was going to happen didn’t fit where the characters actually were when I got to that point on paper. With my last book, The Mayfair Affair, and my new release, London Gambit, I’ve moved into uncharted territory, taking the series forwards in time, not locked into any plot twists in prior books. But there are still certain developments in the overarching plot of the series I know I am writing towards, some of which I’ve had in mind from the start, some of which have occurred to me along the way, The Mayfair Affair introduced a fairly major new romantic pairing for the series. I had actually intended to get one of these characters together with another ongoing character at the start of the series, but I decided several books ago that these two characters were a better match, and I was really excited to finally get to the point where their relationship could progress. Other things I’ve thought I was writing towards end up playing out differently when I get to that point in the story and realize what I thought would happen doesn’t make sense given where the characters now are. I realized she was right. So I drew a deep breath and went through with the plot twist. And I’m glad I did. It opens a lot of very intriguing possibilities for future books that I’m eager to explore. At the same time reading over the galleys, I still felt a pang for my characters. Which I suspect proves that my writer friend was right - this was a good choice to make. Writers, do you plan your series out in detail or make up events as you go? Have you ever felt conflicted about a game changer twist in your series? Readers, what are some of your favorite game changer moments in series you read? DEBS: I cannot wait to read this! And, oh, so many times I've dithered over whether or not I can really put my characters through the plot twists I've come up with--and found, like Tracy, that it was exactly what I needed to do. REDS, readers, what do you think? Do you want your characters to be challenged? I like the idea of challenges for the characters, especially in series books. But it’s disconcerting when an event or a plot twist results in behavior that seems too farfetched and atypical for that character. I suppose it must be that I like a bit of predictability [or is it stability] in my characters. I’m looking forward to reading “London Gambit,” Tracy, and I must say it’s rather comforting to know that the writers agonize over plot twists as much as their readers do. Joan, I so agree! I think one of the challenges of writing a series is keeping it fresh and a bit unpredictable while at the same time keeping the characters true to themselves. The end of Deb's last book had me gasping in disbelief, yet no one had done anything out of character. I hope "London Gambit" seems the same to readers of the series. The end definitely set up a drastic change for almost all the ongoing characters, yet I don't think any of the characters are behaving inconsistently. Excited (and a bit nervous) to hear what readers think! Now that is a tease! Should new readers start at the first in the series before this one? And I definitely make it up as I go… Sometimes though, I agree, I have one gem of an idea (I hope) that I know I want to put in somewhere. My short story "on the house" though, was the only time I started with the ending. And it was really an interesting experience to write knowing where I was going… And an unusual experience for me. Welcome,Tracy! This series sounds like great fun. People ask me why I don't turn one of my standalones into a series and it's usually because I've put that character through enough challenges for a lifetime in just one book. This is fascinating Tracy, in many ways. So in the new series, did you skip over the books you'd already written in the old series? and did your readers follow you to the new series and imagine these were the same characters? I think Joan is right on the mark--plot twists have to fit the characters or they seem unreal or ridiculous. I can remember so clearly the first time I hired an outside editor and she identified ways in which I was forcing my ideas of plot onto the characters instead of allowing it to unfold naturally. whew, hard lesson! Tracy, as always I'm awaiting with bated breath to read Suzanne and Malcolm's new adventure. I already know it will be wonderful. In terms of a writing series, I agree with you. It is a melding of a basic plan with new ideas that pop into your mind. It is those "Eureka!" moments when you as a writer rub your hands together in glee and think, "Oh, yes what a devilishly good plot twist to get my characters into trouble." I freely admit to being a romantic and like Tracy and Deborah, I too devoured Georgette Heyer's Regency novels and mysteries. As a result my mystery series is laced with romantic suspense to add a bit of spice to the story. After all, what is world without love? However as a writer, one's characters must have turmoil to propel the story, or in Tracy, Deborah and my case, the series forward. We all adore happy endings, but then what? No, being "mean" to one's characters and throwing obstacles in their path is the way to keep things interesting and fresh. Tracy, I wish you another tremendous success with LONDON GAMBIT! I also wish all the best to all the Jungle Reds with their books. I started out with the Charles and Melanie books, so I felt a little dislocated for the first few chapters of the first Malcolm and Suzanne book, but then they became absolutely real to me as Malcolm and Suzanne and have been so since. Tracy's books remind me a bit of Diana Gabaldon's, in the sense that she is such a master at making history real. I will never read about the Congress of Vienna, or Waterloo, and so many other things without seeing scenes from these books. (I love the Waterloo book especially. That's Imperial Scandal, right, Tracy?) And of course it is a great romance! Tracy, where would you tell new readers to start? Oh, and I love that your daughter is Melanie. And she is adorable! I think I'm with the others. I have bits and bobs of ideas stashed away, random scenes. My husband asked when I'll use them and the answer is always, "When it's the right story." I want the plot twists, but I want it to feel natural, not forced. I'm curious about the new series and have the same questions as Lucy/Roberta. Did you skip and did your readers follow you? Tracy, I've been reading your series for years and love it. But now you've made me nervous. Major plot twist? I especially liked the story set at the Congress of Vienna. I do believe I fell for Metternich. Thanks for the warm welcomes! Hank, I started writing with Scrivener a few years ago and somehow with it it's easier for me to write scenes out of order. I rarely start with the ending, though. But with this book, once I was toying with going for this plot twist in this book, I wrote early drafts of the final scenes, much earlier than I usually do, even though at first I wasn't entirely sure I'd go through the ending. As to where to start, I would probably start with Vienna Waltz and read the Malcolm and Suzanne books in order then reach the Charles and Melanie books for an "alternate universe" if you want. But one reviewer of "London Gambit" said she didn't know it was part of a series, and it worked fine as a stand alone, so if it particularly intrigues a reader they could start with it and see if they want to go back and catch up on the series. Daniella, it is fun to get characters into trouble, isn't it? I've always loved love stories, but I've always wanted to know what happens after "happily ever after" and that usually means exploring future challenges for the characters. Deb, thanks so much! Yes, "Imperial Scandal" is the Waterloo book. That was an exciting and harrowing book to write - bringing the battle to life was a challenge and it meant putting my characters in the heart of all that brutality. It also introduced Harry and Cordelia Davenport, who began as characters because I knew I needed a soldier character. They became close friends of Malcolm and Suzanne and an important ongoing part of the series. Do you remember saying on FB that you liked the name Cordelia when I posted about naming them? That's when I settled on her name, which is also my daughter's middle name. 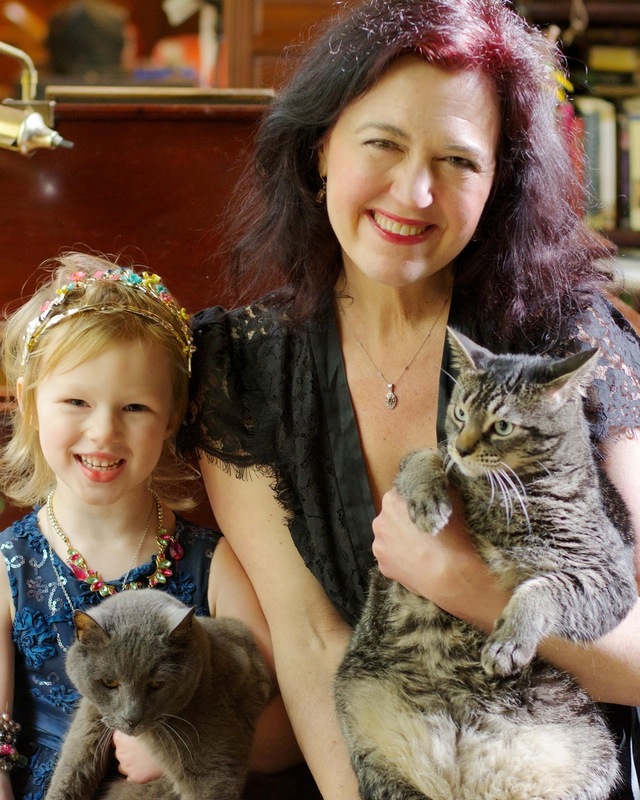 Melanie, by the way, specifically requested to be in my new author photo. Before it had been me with the cats, but this time she made it very clear she wanted to be "part of the picture." As to where to start the series, I think I'd suggest readers start with "Vienna Waltz." There's more about reading order in the FAQ on my website (https://tracygrant.wordpress.com/faq/). Mary, exactly, if one tries to force a plot twist at the wrong time, I think the characters protest, as Lucy/Roberta said. Some of the scenes in "London Gambit" have been playing in my head for years. And, yes, as I said above, I'm sure the series change has frustrated some readers, but in general they've been wonderful about following. And I now have readers who've found the series through the Malcolm and Suzanne books and then gone back and read the Charles and Melanie ones. I also think it's interesting that in general readers seem to think the names they started reading with best suit the characters. We've had some interesting discussions about that on my website. Pat, it's wonderful to know you like the series! I loved writing "Vienna Waltz" and all the real historical characters. I think it's very cool if I wrote Metternich in a way that made you fall for him :-). Yes, this plot twist does shake up the series quite a bit, but as I said in the post, I'm excited for the new avenues it opens up, and I hope readers will be too. Do let me know what you think when you read the book!